It's a heck of a job if you can get it. Easy hours, free transportation, free medical care. There is a saying that the level of societal maturity is the direct inverse of the number of laws. Using machetes and guns, the men fought a desperate battle to take control of two boats off the Somali coast. But this time, it wasn't pirates who launched the attack — it was Egyptian fishermen who had been held hostage for four months and who killed two brigands and took others captive as they regained control of their vessels. Let's have a market-based solution to piracy. All ships and crews are be allowed to be armed for self-defense, and we could pay per-head bounty for pirates. Of course, you can bring in the rest of the pirate if you want, but the head is enough for payment. "Progressive-mind customers" only value free speech when you agree with their views--all of them. Whole Foods Markets CEO John Mackey wrote an op-ed for the Wall Street Journal speaking his mind on "health care reform" and now some of his Birkenstock-shod customer base is all in a tizzy and boycotting his stores. Considering that Harris-Teeter, Food Lion and so on aren't really big in the organic foods market, I have to wonder where these people are going to get their food from. Or maybe they're all going to do the planet a favor and starve themselves to death in protest, eliminating their waste, their contributions to global warming, and their sanctimonious noise pollution. A group usually seen as one of Barack Obama's allies in the health care debate -- AARP -- says the president went too far Tuesday when he said the seniors lobby had endorsed the legislation pending in Congress. This is going to be entertaining to watch play out. On one side, the members of AARP, who seem to be pretty heavily against Big O's New Socialist Health Care. One the other side, the Big O hisself. In the middle, a group who has become too comfortable with their "insider" status and too in love with their power to remember what their mission supposedly is. If you're allergic to fur, I suggest you take an antihistamine now, because it's going to be flying soon. 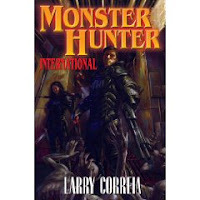 Larry Correia made me lose sleep! He did, and I bet that he isn't even ashamed of it. I'm not a professional book reviewer, so don't expect a professional review. I enjoyed the hell out of this book! It's sort of like an old-fashioned comic book without the pictures (and the ink rubbing off all over your hands). The story starts out with a bang (well, 10 of them actually, .357 caliber) and a werewolf attack. It picks up the pace from there. There are guns, explosives, a beautiful woman who loves to shoot, more guns, the undead, RPGs, more guns, a stripper, more undead, a recoilless rifle, serious evil dudes/dudettes, mortars, paranormal stuff, life after death...oh, and did I mention guns? Lots of guns. It's a great read--one of those books that will both literally will keep you up reading and have you wishing it wasn't over. I'm hoping that there is more to come, but even if there isn't, you should not miss this book. Oh, and Larry, if this is based on fact, don't tell me. Ammo is expensive enough, and if I have to start making my own silver bullets I'm going to have to stop eating. At least, in a small way. Paralyzed Veterans of America has started their Outdoor Recreation Heritage Fund with the goal of creating a $10 million trust fund, the proceeds of which will be used to help paralyzed vets get back into the shooting and hunting sports (among other things). How about hitting the donation button there, OK? A female tennis player sues because some men won't play tennis with her. I don't play tennis (therefore I don't understand all this "ladder" biz), and I know some guys can be touchy about being beaten by a woman, but I think this one is going to backfire on her. Sueing people isn't how you make friends on or off the tennis court, Ms. Griffin. Now let's keep the heat on health care "reform". The Obama administration is proposing to scale back a long-standing ban on tracking how people use government Internet sites with "cookies" and other technologies, raising alarms among privacy groups. And we get a generous two whole weeks to comment on this. Nice. Let the "Big Brother" jokes commence. Wired reports that Tesla Motors has reported a $1 million profit on sales of $20. That's nice. I guess the $465 million loan from the government for retooling facilities had nothing to do with that. Investing $465 million to get a $1 million profit in a company that sold 109 cars in July. That's our government for you. Imagine what they'll do at GM and Chrysler! Government interference in markets is a Bad Thing. Today's case in point deals with energy. It would seem that our ever-efficient Fiddlin' Government is sitting on oil drilling leases that drillers have paid good money for. For seven years in some cases. Enough. It's time for a little action. Do you know a bureaucrat? Someone who works for DMV, or the IRS or some such government job where they can make your life miserable and do so with apparent impunity (either because they don't care or are too stupid to realize the consequences of their actions) ? Try peer pressure. Let me tell you folks, peer pressure is a marvelous thing. If enough of us apply it, things change. The fun thing about peer pressure is that there are so many absolutely legal ways to apply it. Be creative and have fun out there.